Unigine engine allows you to create your own post-effects by writing custom shaders. To write post-effect shaders, you should use the same workflow as for deferred and forward rendering passes: create the material, write vertex and fragment shaders. This tutorial explains how to create a post-effect material, write shaders for it (both vertex and fragment), add a parameter to the material to be able to specify the value from the UnigineEditor. As in all other shaders tutorials, you should create the material first. Let's add a new base material to your project. To create post-effect material, you should specify the post pass for shaders and textures. 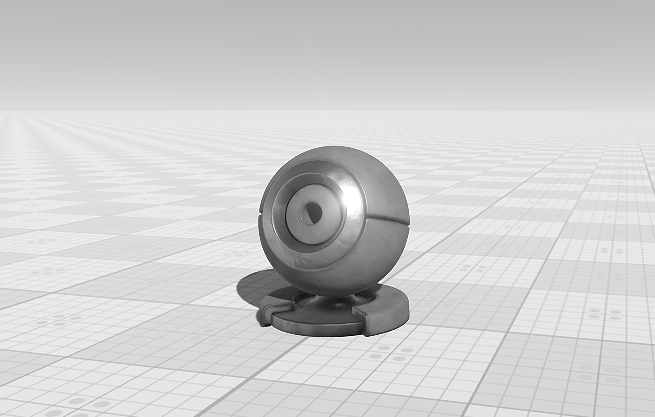 <parameter name="grayscale_power" type="slider" shared="1" min="0.0" max="1.0"
Added a post pass shaders and textures. Added the shared grayscale_power parameter. Save the new material as custom_post.basemat file to the assets/Materials folder. Since we write a simple shader example, let's write a simple shader like the vertex shader for the deferred rendering pass. You should add a new line (press Enter) after closing the instruction (after MAIN_END command). Save the shader file as post.vert to the assets/shaders/vertex folder. The code of the vertex shader is so simple since we don't need to work with the geometry. 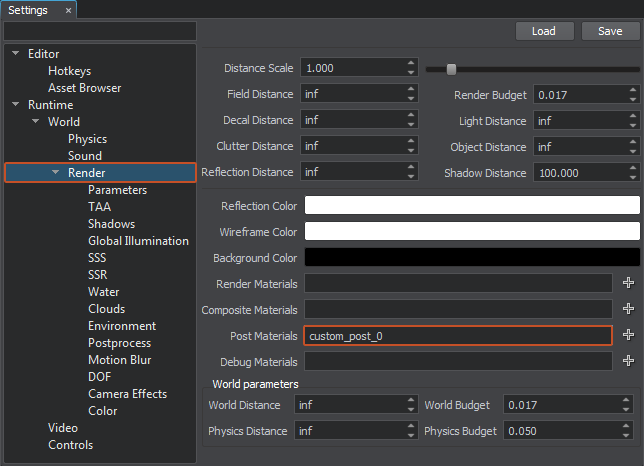 Use the shaders_reload command to reload shaders whilst the engine is running. This section contains instruction how to create a fragment shader (also known as pixel shader). Save the shader file as post.frag to the assets/shaders/fragment folder. We get the texture which was specified in the post-effect material. By applying a standard grayscale equation, we change the color of the scene. By using lerp function (which performs a linear interpolation), we add the custom parameter to adjust the grayscale power. Use the shaders_reload console command to reload shaders whilst the engine is running. Material has been created, shaders have been written, it's time to use it in the project! Open UnigineEditor and launch your project. 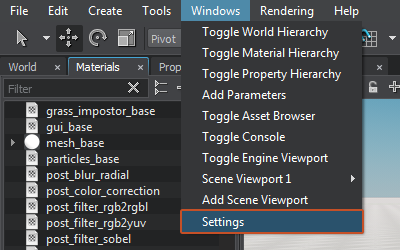 Create a new material by inheriting from the recently created one in the Materials Hierarchy window. In the Settings window choose Runtime -> Render and specify the name of the child post material in the Post Materials field. The grayscale post-effect will be applied. Select your material in the Materials window. Then in the Parameters window select Parameters tab. Set up the grayscale post-effect by adjusting the grayscale power parameter.